With generous support for research funding, The Ehlers-Danlos Society sponsors International Symposium in Ghent, Belgium, to accelerate collaborative global research into EDS, HSD, their related symptoms and associated conditions. GHENT, Belgium, September 28, 2018 – With over 275 scientists, clinicians and patient organizations from around the world, The 2018 International Symposium on the Ehlers-Danlos Syndromes is bringing together the brightest minds in Ehlers-Danlos (EDS) research and clinical management to tackle some of the most pressing questions involving EDS, hypermobility spectrum disorders (HSD) — and myriad of associated symptoms and related conditions. This symposium represents the collective efforts of hundreds of researchers, clinicians and patient experts throughout the world to address these complex, multi-systemic, poorly understood group of disorders. “This symposium represents the collective efforts of hundreds of researchers, clinicians and patient experts throughout the world to address these complex, multi-systemic, poorly understood group of disorders,” states Lara Bloom, international executive director of The Ehlers-Danlos Society. This year’s symposium brings together an international panel of leading clinicians, clinical and basic scientists — and patient support group representatives — to foster multidisciplinary collaboration on the rapidly expanding array of research into the Ehlers-Danlos syndromes and associated pathologies.”We are energetically seeking to accelerate recent clinical advances and delve deeper into the molecular and pathogenic mechanisms underlying EDS and related syndromes,” adds Clair Francomano, chair of The Ehlers-Danlos Society’s medical board and director of The Ehlers-Danlos Society Center for Clinical Care and Research at the Harvey Institute of Human Genetics, Greater Baltimore Medical Center. Presentations will include the molecular etiology of these disorders, the biochemical abnormalities produced by the underlying mutations affecting genes involved in connective tissue homeostasis, the clinical consequences of these mutations and the latest advances in therapies, including medical, surgical and physiotherapeutic treatments, and the effects of these interventions on the natural history of the disease. Ultimately, the symposium will provide the forum necessary for these experts to discuss potential implications of current research and clinical findings, and plan the research necessary to improve the lives of those with EDS and HSD. The previous symposium served as a catalyst for the publication of a groundbreaking comprehensive special edition of the American Journal of Medical Genetics. Comprised of 18 original papers, the supplement, Volume 175, Issue 1, Part C: The Ehlers‐Danlos Syndromes: Reports from the International Consortium on the Ehlers‐Danlos Syndromes, includes the first new update to the classification of the Ehlers-Danlos syndromes in more than two decades, increased the number of named EDS types from six to 13, introduced the newly described hypermobility spectrum disorders and established management and care guidelines for all types of EDS, as well as many of the comorbid conditions sometimes seen in conjunction with EDS. 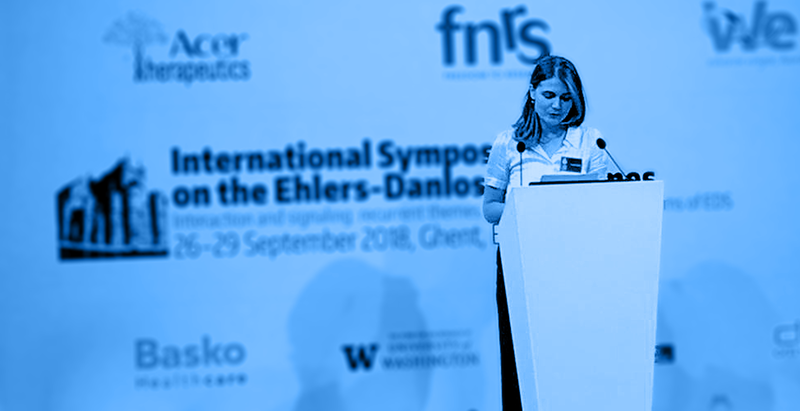 The 2018 International Symposium on the Ehlers-Danlos Syndromes lasted four days, 26 – 29 September, and included current research and poster presentations from experts in the field. At the conclusion of the symposium, a Patient Day will be held on Sunday, 30 September, to allow patients to learn about managing their condition from these world-renowned EDS experts. The Ehlers-Danlos Society is a global community of patients, caregivers, healthcare professionals and supporters dedicated to saving and improving the lives of those affected by the Ehlers-Danlos syndromes, hypermobility spectrum disorders and related conditions. The Ehlers-Danlos syndromes (EDS) are a group of 14 heritable connective tissue gene disorders that produce a spectrum of complex problems across multiple systems of the body. The physical characteristics that are common to all types of EDS include hypermobile joints, skin hyperextensibility and tissue fragility. EDS are known to affect more than one in 5,000 men and women of every race and ethnicity. Although each person with hEDS faces their own set of problems out of the wide range of possible effects, hEDS generally evolves over time. The initial “hypermobility” phase may involve the ability to hyperextend various body parts to extremes normally attributed to contortionists, gymnasts or elite dancers. Over time, the extreme hypermobility and connective tissue instability of hypermobile EDS may lead to permanent injuries. The “pain” phase involves widespread and worsening pain and headache; pelvic pain in women; and worsened fatigue. The “stiffness” phase seen in some adults and in the elderly results in general reduction in joint hypermobility; significant losses in functionality because of disabling pain and fatigue; and increased limitations, due to reduced muscle mass and weakness, prior injuries and arthritis. While certain features of hypermobile EDS are not yet in the diagnostic criteria — as more research is needed to prove causation and the relationships between the hEDS and potential comorbidities — clinical descriptions of hEDS have expanded beyond joint hypermobility to include: chronic pain and fatigue, gastrointestinal disorders, neurological issues, dysautonomia and anxiety. As of this time, hypermobile EDS has no identified distinctive cause. Life expectancy can be significantly shortened for those with the Vascular Ehlers-Danlos syndrome (vEDS) due to the potential for organ and/or blood vessel rupture. While significantly diminished life expectancy is not usually a factor in the other types, quality of life can be severely affected by chronic pain, disability and myriad comorbidities. There are no cures for the Ehlers-Danlos syndromes, but there are treatments which address many symptoms and preventative measures that may help slow their progression.